Alexander Pope was a famous Poet from England, who lived between May 21, 1688 and May 30, 1744. He became 56 years old. 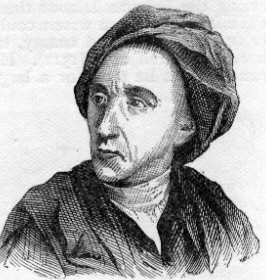 Alexander Pope was a British author, writer and translator. He translated the Iliad and the Odyssey into English, and was known for his well-shaped, often satirical verses. His parents were Catholic, which prevent him from studying at England's Protestant universities, consequently, he was in most respects, self-taught. Because of tuberculosis in the bones, he was no taller than 137 cm and suffered a lifetime of headaches. This may be part of the explanation for his hyper-sensitive and often irritable temper. He took care of long-standing friendship with the authors Jonathan Swift, John Gay and Sir Isaac Newton. He is born under the zodiac gemini, who is known for Communication, Indecision, Inquisitive, Intelligent, Changeable. Our collection contains 89 quotes who is written / told by Alexander, under the main topic Humor. "Some old men, continually praise the time of their youth. In fact, you would almost think that there were no fools in their days, but unluckily they themselves are left as an example"
"No woman ever hates a man for being in love with her, but many a woman hate a man for being a friend to her"
"They dream in courtship, but in wedlock wake"
"The bookful blockhead, ignorantly read With loads of learned lumber in his head"
"Slave to no sect, who takes no private road, But looks through Nature up to Nature's God"
"Charms strike the sight, but merit wins the soul"
"But Satan now is wiser than of yore, and tempts by making rich, not making poor"
"Blessed is the man who expects nothing, for he shall never be disappointed was the ninth beatitude"
"Behold the child, by Nature's kindly law pleased with a rattle, tickled with a straw"
"Beauties in vain their pretty eyes may roll; charms strike the sight, but merit wins the soul"
"Be not the first by whom the new are tried, Nor yet the last to lay the old aside"
"At ev'ry word a reputation dies"
"And die of nothing but a rage to live"
"And all who told it added something new, and all who heard it, made enlargements too"
"An honest man's the noblest work of God"
"All nature is but art unknown to thee"
"All are but parts of one stupendous whole, Whose body Nature is, and God the soul"
"Act well your part, there all the honour lies"
"A work of art that contains theories is like an object on which the price tag has been left"
"A wit with dunces, and a dunce with wits"
"A person who is too nice an observer of the business of the crowd, like one who is too curious in observing the labor of bees, will often be stung for his curiosity"
"A God without dominion, providence, and final causes, is nothing else but fate and nature"
"Woman's at best a contradiction still"
"Wit is the lowest form of humor"
"Whoever thinks a faultless piece to see, Thinks what ne'er was, nor is, nor e'er shall be"
"What some call health, if purchased by perpetual anxiety about diet, isn't much better than tedious disease"
"Virtue she finds too painful an endeavour, content to dwell in decencies for ever"
"Trust not yourself, but your defects to know, make use of every friend and every foe"
"True politeness consists in being easy one's self, and in making every one about one as easy as one can"
"True ease in writing comes from art, not chance, as those who move easiest have learned to dance"
"To observations which ourselves we make, we grow more partial for th' observer's sake"
"The way of the Creative works through change and transformation, so that each thing receives its true nature and destiny and comes into permanent accord with the Great Harmony: this is what furthers and what perseveres"
"The vulgar boil, the learned roast, an egg"
"The same ambition can destroy or save, and make a patriot as it makes a knave"
"The ruling passion, be it what it will. The ruling passion conquers reason still"
"The most positive men are the most credulous"
"The learned is happy, nature to explore; The fool is happy, that he knows no more"
"The hungry judges soon the sentence sign, and wretches hang that jurymen may dine"
"The difference is too nice - Where ends the virtue or begins the vice"
"Passions are the gales of life"
"Party-spirit at best is but the madness of many for the gain of a few"
"Our passions are like convulsion fits, which, though they make us stronger for a time, leave us the weaker ever after"
"Order is heaven's first law"
"One science only will one genius fit; so vast is art, so narrow human wit"
"On wrongs swift vengeance waits"
"On life's vast ocean diversely we sail. Reasons the card, but passion the gale"
"Of Manners gentle, of Affections mild; In Wit a man; Simplicity, a child"
"Not to go back is somewhat to advance, and men must walk, at least, before they dance"
"Not always actions show the man; we find who does a kindness is not therefore kind"
"Lo! The poor Indian, whose untutored mind sees God in clouds, or hears him in the wind"
"Lo, what huge heaps of littleness around!" "Like Cato, give his little senate laws, and sit attentive to his own applause"
"Know then thyself, presume not God to scan; The proper study of mankind is man"
"Know then this truth, enough for man to know virtue alone is happiness below"
"Is pride, the never-failing vice of fools"
"In words, as fashions, the same rule will hold; Alike fantastic, if too new, or old: Be not the first by whom the new are tried, Nor yet the last to lay the old aside"
"If a man's character is to be abused there's nobody like a relative to do the business"
"I find myself hoping a total end of all the unhappy divisions of mankind by party-spirit, which at best is but the madness of many for the gain of a few"
"Gentle dullness ever loves a joke"
"Genius creates, and taste preserves. Taste is the good sense of genius; without taste, genius is only sublime folly"
"For modes of faith let graceless zealots fight, His can't be wrong whose life is in the right"
"For Forms of Government let fools contest; whatever is best administered is best"
"For fools rush in where angels fear to tread"
"Fools admire, but men of sense approve"
"Fondly we think we honor merit then, When we but praise ourselves in other men"
"Extremes in nature equal ends produce; In man they join to some mysterious use"
"Education forms the common mind. Just as the twig is bent, the tree's inclined"
"Praise undeserved, is satire in disguise"
"How shall I lose the sin, yet keep the sense, and love the offender, yet detest the offence?" "Histories are more full of examples of the fidelity of dogs than of friends"
"Pride is still aiming at the best houses: Men would be angels, angels would be gods. Aspiring to be gods, if angels fell; aspiring to be angels men rebel"
"Teach me to feel another's woe, to hide the fault I see, that mercy I to others show, that mercy show to me"
"Men would be angels, angels would be gods"
"Honor and shame from no condition rise. Act well your part: there all the honor lies"
"Some people will never learn anything, for this reason, because they understand everything too soon"
"Hope travels through, nor quits us when we die"
"Hope springs eternal in the human breast: Man never is, but always To be Blest"
"Those move easiest who have learn'd to dance"
"Never was it given to mortal man - To lie so boldly as we women can"